UDM Downloads > Chess Puzzle Games! Collection of 6 chess tutorial games, puzzles, and training simulators for kids. Play and learn chess! Improve your chess skills! 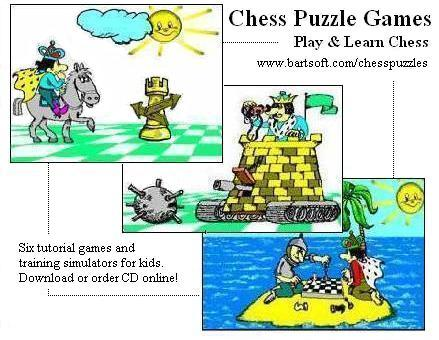 Included games: Chess Mazes, AlterWay, Last Move, Chess Miner, Blindfold, Crazy Chess. The games has two modes: Play and Training. All playing tasks and puzzles are newly generated by the program, their number being virtually unlimited and the possibility of encountering the same situation twice practically equalling zero. There are up to 10 levels in each game. First levels are free. Available for download or on a CD. Chess Mazes: What is the best route to transfer your piece from one square to some other? Finding the shortest path will not always suffice... AlterWay What should be the right sequence of capturing the computer's pieces? You need to figure out everything in advance and start acting only afterwards. Last Move Training simulator + generator of four fascinating games in which you are to apply different methods for weaving a mating net for the opponent's King. CrazyChess: Chess program playing in Losing Chess (Giveaway Chess, Suicide Chess) on the boards of different size. Blindfold: Test & Training simulator. Would you like to test and improve your calculation abilities and visualization? Professor CLEVER will help you... Chess Miner: Hard puzzle for funs. Only your opponent knows the routes his pieces take. Your aim is to "undermine" all computer's pieces by means of the mines.